Before you dive in, we suggest drawing up (and sticking to) a study schedule that will guide your preparation. You have a lot riding on your police exam. You’re also doing the work you need to do to reach your goals. Unfortunately, though, simply knowing that you’re working hard won’t make your test anxiety go away. Thus, here are some stress-management tips from our long experience of helping students prepare for standardized tests. Once you’ve set up a study schedule for yourself, treat it like a job. That is, imagine clocking yourself in and out of police exam studies according to that schedule. Do your best to stick to your schedule, and when you’re not “clocked in,” don’t let yourself stress out about your upcoming exam. That will help you release your stress about the test in between study sessions. If you get tired, overwhelmed, or discouraged when studying, don’t respond by pushing yourself harder. Rather, step away and engage in a relaxing activity like going for a walk, watching a movie, or playing with your cat or dog. Then, when you’re ready, return to your studies with fresh eyes. One week, memorize and practice question types that fall under the umbrella of Spatial Orientation, Visualization, and Memorization until you’re confident about what you will have to do if you see these question types on your exam. One week, take a practice exam under test-like conditions: time yourself and find a quiet room with no distractions. Allot time to review all answer explanations, and make a note next to the question types that are giving you the most trouble. Review the chapters that cover the material giving you the most trouble. One week, review all Information Management and Problem Sensitivity question types until you can identify each question’s type and its appropriate strategy. Poor health, fatigue, and isolation make it harder to cope with stress and anxiety. Get on a regular sleep schedule as much as possible during your studies, eat well, continue to exercise, and spend time with those you care about. Also, don’t fuel your studies with caffeine and sugar. Those substances may make you feel alert, but they can also damage focus. Most importantly, keep telling yourself that you can do this. Don’t fall into the trap of thinking that you’re not “allowed” to feel confident yet. That’s a self-punishing attitude that will only hurt you. Remember that confidence breeds success. Let yourself be confident about your abilities. You’re obviously ambitious and have a solid career goal in mind, so walk into your exam knowing that about yourself. If you get discouraged about your goals, stop what you’re doing and make a list of everything you’re good at. List every specific skill that you are bringing to the police exam. Post that list in a place where you’ll see it every day, and add to it as you continue to study. We at Kaplan recommend this because many people focus too heavily on their weaknesses while preparing for a standardized test. But if you only focus on your weaknesses, you aren’t seeing an objective picture. There are skills on the exam that you’re good at. Keep that in mind, and focus on building on those strengths. 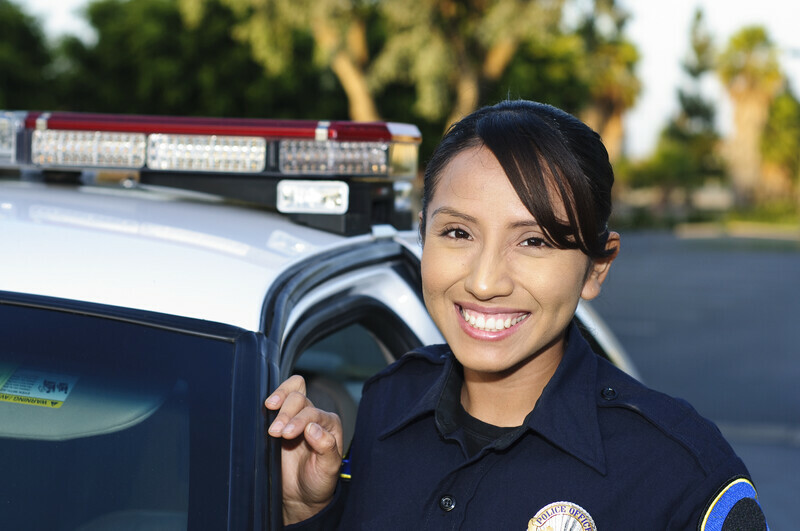 In the last few weeks before Test Day, do a comprehensive review of all police exam topics. Take a full-length practice test at least once a week, and use the results of those full-length tests to inform your review. Be sure to contact the program administering your exam to find out everything you can about your test date—what you should bring with you, when you can expect your scores, and how long you can expect to be at the testing center. Rest: Make sure you’re on a regular sleep schedule. Rehearse: Find out where your testing center is located, and consider doing a “dry run.” That is, drive or commute to the testing center around the same time of day as your testing appointment. You don’t want to be surprised by traffic or road construction on Test Day. Stop: Two days before the test, stop studying. No studying at all: you’re not likely to learn anything new in those two days, and you’ll get a lot more out of walking into the test feeling rested. Relax: The evening before the test, do something fun but not crazy or tiring. Maybe you could have a nice dinner (without alcohol), watch a movie, or do something else relaxing. Go to bed at your usual time the night before the exam. Warm up: Before you take the test, briefly awaken your brain. You probably can’t take any practice materials into the testing center, but you can do a few easy practice problems at home or in the car before you go into the testing center. Don’t let nerves derail you: If you feel nervous while taking the test, remember to breathe deeply into your stomach. Take a few deep breaths and focus your eyes on something other than the computer screen or test booklet for a moment. Keep moving: Don’t let yourself get bogged down on any one question. If you’re taking a test where you can skip problems and come back to them, do so whenever they threaten to slow you down or to steal time from the other questions. If you’re taking a computerized test and can’t return to previous questions, you may have to decide to make a guess if a question is threatening to take too much time. Don’t assess yourself: This is very important. As you’re testing, don’t let yourself stop and think about how you feel you’re doing. Taking a standardized test hardly ever feels good. Your own impressions of how it’s going are totally unreliable. So, instead of focusing on that, remind yourself that you’re prepared and that you are going to succeed, even if you feel discouraged as the test is underway. After the test, celebrate! You’ve prepared, practiced, and performed like a champion. Now that the test is over, it’s time to congratulate yourself on a job well done. Celebrate responsibly with friends and family, and enjoy the rest of your day, knowing you just took an important step toward reaching your goals.